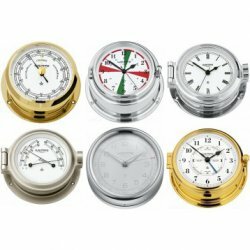 The traditional German company WEMPE produces marine instruments of all kinds - classical ship's clocks manufactured with modern quartz movements, exclusive barometers with visible movement and combined instrument panels, such as the thermometers and hygrometers. WEMPE instruments can show time, measure atmospheric pressure, and indicate temperature. This is convenient but not all: WEMPE products look good with their high-quality housing that is available in different types. Solid aluminium or colourlessly lacquered brass - a decision between modern design and classical appearance. Take some time and look through our large assortment of WEMPE instruments - after all, you will be working with these tools for a long time. Consider our beautiful instrument panels on elegant wooden boards that combine many functions in one product.